It is no secret that UK players are in love with their Fruit machines. Mainly because Fruit Machines aka Fruitys have some of the most interactive slots game play known to man. 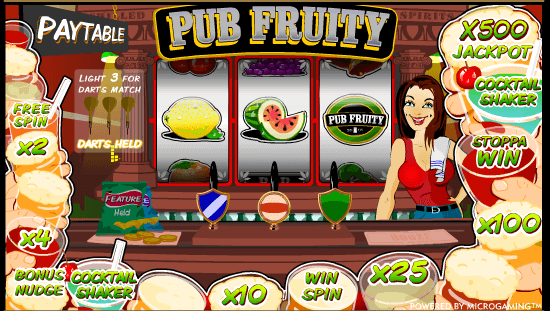 Microgaming’s Pub Fruity slot is no different with plenty of interactive features commonly found on pub fruit machines around the UK. Nudges, holds, free spins, skill stops, gamble features and all the nuts and bolts that put together a much loved way to roll the reels. There is a single pay-line, 3 reels and of course what would fruity be without that special bonus board feature to navigate in order to progress to higher paying prizes the further you get. Should you hit the top score, there is a 1,000x multiplier of your stake, which at the maximum bet is a superb £20,000 jackpot; while, at the minimum bet of £0.10 per spin, you will walk away with a £100 win. It is an AWP game based on classic fruit slots with a pub darts theme. No surprise there as the dartboard in the UK pubs and bars is a well-known and much used feature where pub darts teams travel to different pubs to compete and show off their skills. In Pub Fruity, you have to master the darts board to get the top prize of a x1,000 bet multiplier. That top paying jackpot bonus can be won by rolling your way onto the board using all the features you have at hand to get there. Nudges will help you move the reels into position or you can use hold to hold the bonus game symbol icon on as many of the reels as possible in the hope that the next spin will produce a bonus winning spin. You can also get into the Drinks Trail bonus game where there is a x500 multiplier bonus jackpot if you get your drinking boots on and win enough free spins where the x500 multiplier resides. This is a really cool game that brings all the classic interactive fruit machine features together into one bonus and you get the chance to win one of them. Let’s not forget you will have all the tools available on fruit machines. Nudges and holds being the most popular of all thus rounding up what is simply an awesome pub fruity slot machine with 3 different jackpots to aim for starting at 250 times you spin bet, going up to 500 times your spin bet and if get really lucky on the main bonus game, you could be walking away with 1,000 times the bet. There is only 1 payline on Pub Fruity, nonetheless that doesn’t mean you can’t ramp up your stake to increase the risk for the prospect of higher returns. You can lay down £0.10 as the minimum stake or ramp up the bets to a high of £20.00 per spin. In total there are 8 combination symbols and a strawberry that represent the bonus drinks trail bonus theme. You will be playing in a theme that comes with all the quirky British pub characteristics with a barmaid included to spice up the fun. On top of this, all the famous fruity symbols are available including the Liberty Bell, purple grapes, cherries, lemons, organs and the bar symbol. You can spin in a win for as low as x2 cherries on the payline, which will land you a x2 multipliers of your cash spin bet. To calculate the jackpot win, all you need to do is multiply your cash stake bet by the jackpot multiplier win amount, which is 250x you stake on the lone payline. The highest cash jackpot you can win is £5,000. You won’t have any trouble spotting the jackpot symbol – it is the ‘Pub Fruity’ symbol itself written in white with a black background and a green border. 3 of these on the payline will send you into the money immediately. Entering into the bonus darts games requires you to land just 1 symbol that has the dart icon attached to it. Any of the symbols on the game can have the dart symbol attached, and the more you land the more darts you get to throw. You will find because you just need a single dart on the reels, this bonus feature will come up very often during the game. If you get 3 symbols, you will enter into the ‘Darts Contest Game’ where the x1,000 multiplier jackpot resides. All you need to do is choose the character that will play for you. All 3 players throw their darts and your players total and position in the contest will decide your multiplier payout, which is decided according to the amount you bet on the triggering spin bet. Nudges are awarded all over the place on the Pub Fruity slot game. They can be awarded at random in the normal game of spins affording you the opportunity to move the reels into a favourable position that either links up combinations, one of the bonus features or gets you into a position where you will automatically be awarded the chance hold the symbols you nudged into position for a chance to win on the next spin. Occasionally, you will be awarded the ‘Let em Spin’ feature because you moved to like symbols on reels adjacent to each other. This means the next spin will guarantee a win. The hold feature is another awesome interactive side to pub fruit machines. 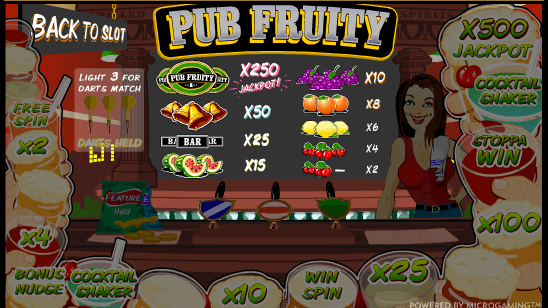 On Pub Fruity, you’ll be given the chance to hold the reels at random. If you are familiar with video poker machines, then you’ll know how useful holds can be. All you need to do is press the hold button the respective reels you want to stay in position on the next spin. When you press the spin button, the reels held will not spin. Occasionally this feature will spin in a third symbol completing a winning combination. Land the strawberry 3 times on the reels. Each symbol will have a number attached and this will determine how far you will move along the trail bonus. The higher the better because you can win up to a x500 multiplier of the cash bet wagered on the spin that triggers the feature. Blank Drink will mean no win, which is unfortunate! Also, you can win 1 Free Spin, x2 multiplier or x4 multiplier of the spin bet. A bonus nudge to move one of the reels down or a cool cocktail shaker that will reshuffle your position on the trial bonus to any of the other features, which could be the jackpot! In addition, you may get the stop a win feature where all the features will be flashing one by one, but very quickly! Wherever you stop the bonus is you prize. Finally, there are x10 and x25 multipliers on the trial bonus, plus the chance to win a x25 multiplier, x100 multiplier or a massive x500 multiplier. The latter being the jackpot.